(Macao, Jan. 2, 2019) – Sands China Ltd. has discontinued its use of plastic straws at all its properties, in an effort to reduce the consumption of single-use plastics. The company’s ban on its use of plastic straws went into effect Tuesday and will eliminate the use of 2.2 million plastic straws each year – saving 1 ton of plastic annually. Laid down end-to-end on the Hong Kong-Zhuhai-Macao Bridge, that’s enough straws to stretch from Macao to Hong Kong 10 times. The move is one of several new initiatives to curb the use of single-use plastics at Sands China’s properties, which employ more than 28,000 team members and received more than 92 million visitors in 2017. Those other measures include a plan to progressively replace hotel rooms’ single-use bathroom amenities – such as shampoo and conditioner bottles – with refillable dispensers. Implementation is scheduled to begin early this year and is estimated to eliminate around 2.7 million plastic bottles per year. Sands China has also redesigned the complimentary bottles of water supplied to rooms and suites, resulting in 3 million fewer bottles of water provided per year. Additionally, the company is installing filtered water dispensers in properties’ public areas on a trial basis. If successful, the change would be rolled out at all properties, massively reducing the usage of bottled water. Sands China’s initiatives to reduce single-use plastic have also identified other areas for improvement. One such area is in the company’s laundry services, where efforts are being made to eliminate, replace, or recycle 95 per cent of single-use plastic packaging, clothes hangers and garment clips. Sands China’s environmental initiatives are part of the Sands ECO360 global sustainability strategy of parent company Las Vegas Sands Corp., which utilises measures like energy saving, resource recycling, conservation and community engagement. Sands ECO360 is designed to help minimise the company’s environmental impact and lead the way in sustainable building development and resort operations. 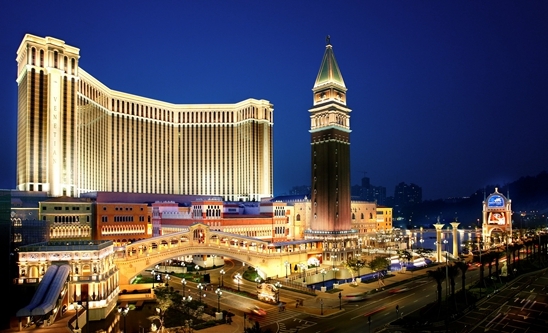 Photo caption: Sands China Ltd. has discontinued its use of plastic straws at all its properties, including The Venetian Macao (pictured), in an effort to reduce the consumption of single-use plastics. The move will save 1 ton of plastic annually and is one of several new initiatives to curb the use of single-use plastics at Sands China’s properties.